If you have any questions about the CORONA information page below please contact us. 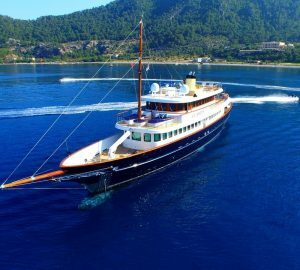 Superyacht Corona (ex Jetaime Too) is a beautiful 31,50-metre wooden vessel, originally launched by Turkish shipyard Bilgin Yachts in 2007. With last refit by KRM Yacht in Istanbul in 2015, luxury motor yacht Corona has been superbly designed by Kerim Demir. Accommodation aboard Corona yacht is divided into 5 lovely and comfortable cabins, including two master cabins, one VIP cabin and two guest cabins, in addition to three crew cabins. RINA classed, super yacht Corona (ex Jetaime Too) is powered by twin MTU 12V 2000 M93 diesels, delivering her a top speed of 25 knots and a cruising speed of 20 knots. The 2015 refit of luxury yacht Corona included painting of the hull and superstructure with Awl-grip; changing of all interior upholstery, mattresses and curtains; changing of all exterior upholstery; repairing of propulsion system; the 5-year survey, as well as maintenance of main engines and gensets. Luxury yacht Corona can comfortably sleep her guests in 5 well appointed cabins, including two master cabins, one VIP cabin and two guest cabins. There is also space for a highly trained crew in 3 crew cabins. We do have available further amenity, owner and price information for the 31.50m (103') yacht CORONA, so please enquire for more information. The luxury yacht CORONA displayed on this page is merely informational and she is not necessarily available for yacht charter or for sale, nor is she represented or marketed in anyway by CharterWorld. This web page and the superyacht information contained herein is not contractual. All yacht specifications and informations are displayed in good faith but CharterWorld does not warrant or assume any legal liability or responsibility for the current accuracy, completeness, validity, or usefulness of any superyacht information and/or images displayed. All boat information is subject to change without prior notice and may not be current.